Alen - Paralda : Air Purifier Review • The Air Geeks, reviews of air conditioners, dehumidifiers and air purifiers. Are you looking for an air cleaning system that is capable of transforming the indoor environment of your home or office? 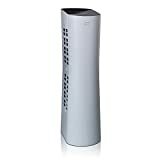 The Paralda tower air purifier is a sleek air cleaning system that is designed to effectively remove airborne particles from the air in your room. Apart from capturing airborne particles, this unit is also capable of removing bad smells and microbes from the air in your space. Considering that you could be looking for an air cleaning system for your home or office, we have tested this unit and researched about it to provide you with all the details that you need before making an order. Apart from providing a detailed description of its features and performance, we have also gathered information about its strengths and weaknesses to enable you to make a well informed decision. To start with, we will explore the features of this powerful air purifier. The Paralda is a beautiful air cleaning system that is capable of capturing various airborne contaminants including dust, pet dander, mold spores, pollen, and microbes. This unit employs a dual purified air venting system to ensure that the air in your room is always clean and fresh. It fills your room with multi-filtered air to protect you and your family from harmful airborne contaminants. Apart from ensuring that your space is free from common airborne particles, this unit is also capable of capturing bad smells, allergens, chemical pollutants, and microbes. Although there are many air filtration technologies that can be used to capture airborne pollutants, most of them are not as effective as HEPA filtration. The Paralda tower air purifier uses a combination of HEPA filtration and ionization to capture airborne contaminants. If you have been experiencing allergic reactions such as coughing, then this unit can help to get rid of the allergens in your room. The Paralda uses the highly effective HEPA-Silver Filter to purify the air in your room. Moreover, this unit has a UV lamp that is capable of destroying airborne bacteria. When selecting an air purifier, it is necessary to consider the size of your space. The Paralda tower air purifier is designed for medium-sized rooms that are up to 500 square feet. This unit is suitable for medium living rooms, bedrooms, offices, and so on. To ensure that the unit is offering optimum performance, you should replace the filter after every six months. However, if your air purifier is not running 24/7, you can stay for few more months without the need to replace the filter. If the unit is rarely used, you can replace the filter after 12 months. It is also necessary to service the unit on regular basis. Are you looking for a unit that you can use in more than one room? You can move this portable unit from one position toanother depending on your air cleaning needs. For instance, you can have it in your study room during the day and move it to your bedroom at night. In addition, this unit is EnergyStar certified and it is, therefore, optimized to consume minimum power. If you are looking for a unit that can run for days without requiring your attention, then this air purifier may not be the best option for you. Unlike most air purifiers, this unit loses settings when power goes off. You, therefore, need to program it after every power disconnection or power outage. Effective in capturing airborne contaminants. This air purifier effectively removes a wide range of airborne contaminants to ensure that your space has fresh and uncontaminated air. If you have been struggling to control your allergies, then you should consider investing in this unit. Quiet operation. As compared to other units of same capacity, this unit is relatively quiet. At lowest speeds, it can be used in spaces that demand quietness such as bedrooms and study rooms. Loses settings when power is disconnected. You are required to program the unit after power disconnection or power outage. As such, the unit can be attention demanding if you live in a place that experiences intermittent power outages. My story starts little over a year ago. We live in the northern US, but spend a few months of the winter in the desert to escape the cold. Last year, after about a month in the desert, our French Bulldog became so congested she could hardly breath through her nose. I believed she had allergies. We took her to the Vet and because the congestion was mainly in one nostril, the Vet didn’t believe it was allergies. We spent about $3,600 on Vets and tests only to find she had no obstruction, but the Vets had no clue as to her problem. They prescribed a strong/nasty nose drops that they didn’t want us to use more than twice a week (that cost $105 a bottle w/a coupon) and a specialty drug anti-inflammatory. Soon after all this expense, we left to go back to our home in the north. She immediately started getting better w/little issues throughout the summer. Then in late fall, we arrived back to the desert. Within a month, she couldn’t breathe through her nose – again. We were giving her Benadryl 4 – 5 times a day rather than use the harsh nose drops. Convinced her problem is allergy, I did internet research and found a Pet Medical site that suggested for animals that have nose congestion and primarily live in the house to try an air purifier. This takes me to my air purifier research that found the Alen Corporation. 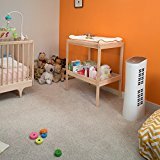 We purchased the Alen Breathe Smart FIT50 for our living room and the Alen Paralada HEPA Dual Airflow Tower for our bedroom. Within a week, she was down to 1 dose of Benadryl a day. My husband and I also notice how much better we sleep at night and how few sneeze attacks we experience. These two air purifying systems have solved our problem. They are quality, quiet and blend into our space. We have never purchased any other brand, but if we want to add to what we have or need to replace we’ll purchase from the same manufacturer. They are not inexpensive, but you can buy these systems with confidence." I've always been skeptical on "air purifiers" as I really thought they were a scam. I happened to be in my Doctors office taking my 6 years old son in for an unrelated matter when I mentioned to her that both of my sons, 6 and 7 seemed to be coughing in the night and in the morning. I put a humidifier in their room thinking that it may be the dryness we experience in Southern California. That didn't work. Then I ordered the Alen air purifier. Well all I can say is that I started the Alen air purifier at about 4 PM that afternoon and have not heard a cough since. I run it at night on level 2 and the kids do not cough anymore. Coincidence? I don't think so. The unit is well designed and quite sleek and works very well. I don't know if it is better than all other air purifiers, all I can say is that it did the job for me." The Paralda tower air purifier combines HEPA, ionization, and UV filtration mechanisms to ensure that your room is free from various airborne pollutants. This unit effectively captures airborne contaminants to protect you from harmful airborne pollutants. On the flip side, this unit loses settings every time power is disconnected and it is, therefore, not a suitable option for places that experience intermittent power outages. If you think its strengths outweigh its weaknesses, then you can proceed and order this unit.